My family hosted an Ayusa exchange student, Lusha (ShaSha) Xu, from China, during the 2006-2007 school year. She graduated from our high school then attended a local college, Lycoming College, for four years. She is now in her third year of dental school at Case Western Reserve School of Dental Medicine in Cleveland, OH. She is a member of our family and always will be. She comes home during breaks, calls us Mom and Dad and we treat her like our biological daughter. Ever since her first year in the U.S,. as an Ayusa exchange student, her family has been inviting us to China. We finally made the trip during the summer of 2012. We spent about three weeks in China. Our trip started off with a problem, but it was a good thing. We missed our connecting flight in Japan so Delta put us up in a hotel overnight. When we emerged from the airport, Eriko Yamamuro, our Japanese Ayusa exchange student from 2009-2010, and her family were waiting to greet us. They saw online that we weren't going to make our connecting flight so they drove 2 1/2 hours to surprise us. We spent about one hour with them! :) We arrived in China a day later. We began in Beijing when ShaSha and her mother picked us up at the airport. We walked on the Great Wall at Badaling, went to the Forbidden City, ate Peking Duck, visited the Olympic venue and had our photos taken as Chinese Opera characters! Next we were flown to Xi'an to see the terra cotta warriors, which were amazing. From there we were flown to Yichang where ShaSha's father, two aunts, grandparents and other extended family members waited for us to board a river cruise ship. We all cruised down the Yangtze River for four days. We stopped and visited many sites along the way. The cruise ended in Chongqing, ShaSha's home town. From Chongqing we were flown to Jiuzaigou , a beautiful resort high in the mountains. We dressed up in Tibetan clothing, visited Tibetan shops and homes and walked along beautiful blue-green glacier pools. From Jiuzaigou we were flown to Chengdu. Chengdu was something that we were looking forward to because...we held pandas! We had researched it on the Internet and we looked forward to it the entire trip. 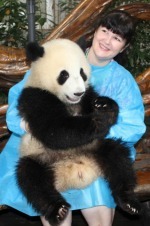 ShaSha, my daughter Valerie, and I each held a panda. It was only for a few minutes, but it was worth it. We attended a cultural show, which was really interesting. From Chengdu, we rode a fast train back to Chongqing to spend a week with ShaSha's family. We bought souvenirs, went to a spa for a day and went to a "hot pot" restaurant. At the end of our trip, we said good-bye to all of the relatives at the airport and flew back to Beijing and then home. ShaSha returned back to the U.S. with us. This was the first international trip for my husband and daughter. After getting 'bit by the travel bug' they now want to go to Japan someday. After spending three weeks there with the Japan Fulbright Memorial Fund in 2008, I am ready to go again!